We are one of the leading Service Provider, Distributor, Exporter, Trader & Importer of Feed Processing Line. We feel immensely pleased to offer an exclusive array of Fish Feed Processing Line. 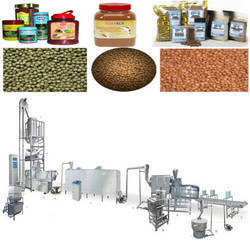 Our provided processing line is examined in terms of quality in order to supply a flawless range. In addition to this, we provide this processing line in different specifications, in order to meet varied needs of clients. Also, this processing line is highly acknowledged for its long lasting performance among our clients. 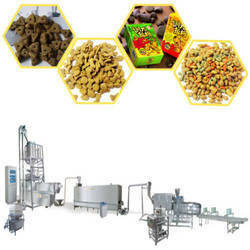 With a thorough understanding of the market of the day, we are offering an innovative range of Pet Food Processing Line. The given processing line is precisely designed by vendor’s professionals utilizing superior quality components and by following set industry guidelines. Our processing line is acclaimed in the market owing to its features like longer service life and reliable functionality. Moreover, this processing line is carefully tested on international quality standards by experts to assure its flawlessness. It is often thought that vacuum coating is invented in Norway. The idea might have been Norwegian, but the technology was developed in the Netherlands. 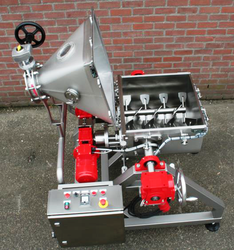 It has been 25 years now since Dinnissen, together with aqua feed producer Skretting, invented the first vacuum coater. Now, after years of development and innovation, Dinnissen offers the optimal solution for the feed, pet food, food and chemical industries. The Pegasus® Vacuum Coater is intended for everyone who wishes to manufacture pelleted and extruded products in accordance with most modern production specifications. It allows you to create a vacuum environment for your production process and to deal effectively with a very wide range of future challenges. Precision is often vital when it comes to working with functionally important ingredients. The Pegasus® Vacuum Coater allows you to coat each pellet with precisely the right amount of powder or liquid, which is then distributed deep into the pellet. The result: the highest possible level of homogeneity and precisely the intended effect. With the Pegasus® Vacuum Coater you can reduce the waste of valuable ingredients to a minimum while also ensuring that their future integrity is preserved. During the production process a robust protective layer is applied to each pellet, which prevents the pellet from breaking or crumbling and conserves valuable ingredients contained in the pellet. Each pellet retains its original shape, and less crumbling also means a reduction in costs associated with the cleaning of transport systems. If you wish to add even higher percentages of supplemental liquids or additional ingredients in a very homogeneous fashion, you’re often presented with difficult challenges. In such cases, the Vacuum Coater provides you with new opportunities by allowing you to quickly and effectively apply several layers to pelleted or extruded products. Dinnissen Pegasus® Vacuum Coaters are available in many different sizes, varying from the PG-10VC (10 litres nominal capacity) up to the PG-5000-VC (5000 litres nominal capacity). Liquids (fats, acids, enzymes, vitamins, etc.). 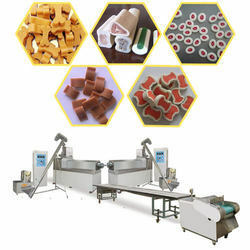 Under precious guidance of our skilled professionals, we are offering an extensive range of Pet Treats Processing Line. Offered processing line is developed with high grade components and modern technology under the direction of vendor’s experts. Our processing line is high on demand in the market for its infinite features. Customers can easily avail this processing line from us at competitive rates within given period of time. Looking for Extrusion Feed Processing Line ?